Remorseless Winter: Drain the warmth of life from all nearby enemies, dealing Frost damage over 8 sec and reducing their movement speed by 50%. Strength > Critical Strike > Haste > Mastery > Versatility. Icy Talons: Frost Strike also increases melee attack speed by 10% for 6 sec, stacking up to 3 times. Murderous Efficiency: Consuming the Killing Machine effect has a 50% chance to cause you to gain 1 Rune. This tier offers a choice between boosting basic damage abilities. Shattering Strikes offers a significant boost to single-target DPS, while Murderous Efficiency offers some further flexibility via Rune generation. Icy Talons has interesting synergy with the lv 90 talent Runic Attenuation to allow for significant runic power generation. Frozen Pulse: While the DK has no full Runes, auto attacks radiate intense cold, inflicting Frost damage on all nearby enemies. Horn of Winter: Blow the Horn of Winter, gaining 2 runes and generating 10 Runic Power. 30 second CD. Two talents in this tier are significant AoE damage increases. Freezing Fog is a straight up bonus to Howling Blast and Frost Fever, while Frozen Pulse allows for AoE damage to continue when no Runes are available to be used. Horn of Winter is an excellent talent for flexibility, allowing the player to further control Runes and Runic Power on a short CD. Hungering Rune Weapon: Empower the rune weapon, gaining 1 rune and 5 Runic Power instantly and every 1.5 sec for 12 sec. 3 min CD. Hungering Rune Weapon is another talent aimed at managing resources, and lines up extremely well during periods of Bloodlust or Time Warp. Both Avalanche and Icecap synergize well with Critical Strike, where Avalanche focuses on AoE and Icecap on single target damage. Abomination’s Might: Obliterate critical strikes have a chance to drive lesser enemies to the ground, stunning them for 2 sec. Players are Dazed for 5 sec instead. Blinding Sleet: Targets in a cone in front of you are blinded, causing them to wander disoriented for 4 sec. Damage may cancel the effect. 60 second CD. Winter is Coming: Enemies struck 5 times by Remorseless Winter while your Pillar of Frost is active are stunned for 4 sec. Level 60 talents are focused on Crowd Control. Abomination’s Might converts randomness into a no-CD stun, while Blinding Sleet gives more AoE control but on a longer CD. Winter is Coming works well if it can be lined up with Pillar of Frost, and has synergy with Icecap. Volatile Shielding: Anti-Magic Shell turns enemies’ magic against them, absorbing 35% more damage, but generating no Runic Power. When it expires, 25% of all damage absorbed is dealt as Arcane damage divided among nearby enemies. Permafrost: Damaging auto attacks create an absorb shield equal to 30% of the damage dealt. White Walker: The DK takes 20% reduced damage while Wraith Walk is active. Upon entering or leaving Wraith Walk, all nearby enemies are slowed by 50% for 3 sec. Three great talents that are all useful in different situations. Volatile Shielding turns a defensive CD into a significant DPS ability in magic-heavy encounters. White Walker combines a movement increase with a flat 20% damage reduction. Permafrost has some very interesting synergy when combined with Icy Talons and Runic Attenuation. Frostscythe: Grants a new ability. A sweeping attack that strikes all enemies in front of you for (120% of weapon damage) Frost damage. This attack benefits from Killing Machine. Critical strikes with Frostscythe deal 4 times normal damage. Gathering Storm: Each Rune spent during Remorseless Winter increases its damage by 10%, and extends it by 0.5 sec. The Frostscythe ability adds a new twist into the Frost DK rotation for both single-target and AoE encounters. Gathering Storm allows for Remorseless Winter to hit significantly harder. Runic Attenuation has a great deal of synergy with a few other talents like Icy Talons and Permafrost for a unique playstyle choice. Obliteration: For the next 8 sec, every Frost Strike hit triggers Killing Machine, and Obliterate costs 1 less Rune. 1.5 minute CD. Breath of Sindragosa: Continuously deal Shadowfrost damage every 1 sec to enemies in a cone in front of you. Deals reduced damage to secondary targets. You will continue breathing until your Runic Power is exhausted or you cancel the effect. 2 minute CD. Glacial Advance: Summon glacial spikes from the ground that advance forward, each dealing Frost damage to enemies near their eruption point. 15 second CD. Breath of Sindragosa and Glacial Advance offer some significant AoE damage options. Glacial Advance is on a very short CD and offers a lot of control over the extra damage, while Breath of Sindragosa is on a longer CD, but has a longer effect if the player manages Runic Power. Obliteration is a significant single target DPS increase, particularly at high levels of Haste. This build focuses on the Frost DK generating a great deal of Runic Power and using that for both offensive (Breath of Sindragosa) and defensive (Permafrost) abilities. This build has even more potential upon acquiring the Artifact weapons in Legion. This is the new version of the old Machine Gun Frost DK, that focuses on rapid AoE damage. 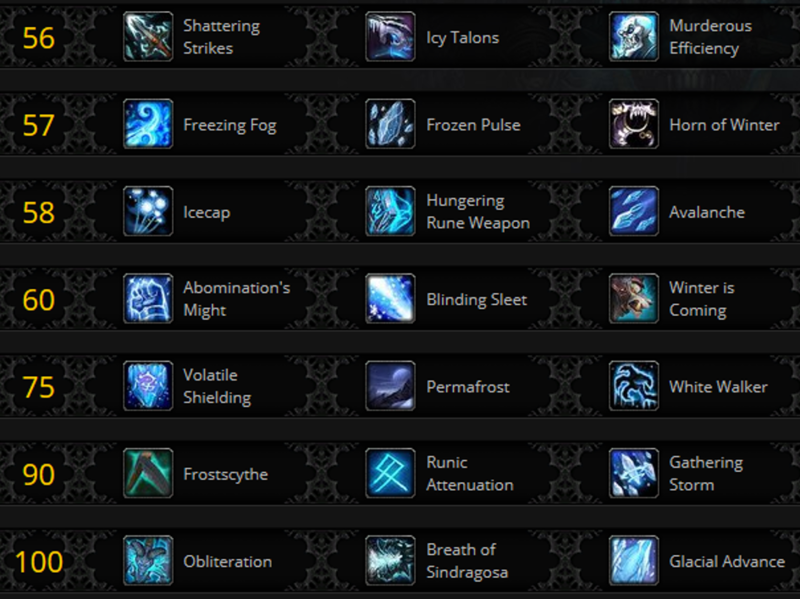 This build maximizes the single target damage of the Frost DK through empowering Obliterate. Crystalline Swords: Your melee attacks have a chance to create icy copies of Icebringer and Frostreaper, which will then stab and pierce your foes. Additionally, standing still for some time while wielding the Blades will cause a patch of ice to grow underneath the Death Knight’s feet. The following is the basic priority rotation for Frost DKs. It does not include talent choices.